Why is it that some businesses struggle to recruit and others have hundreds of applicants for every job vacancy? How is it that some brands invoke zealot-like enthusiasm in their employees and others, a lacklustre indifference? And what are certain organisations doing to generate enviable productivity levels, whilst others lag behind? The answer is that employees bring a brand to life and the most successful brands are powered from the inside out. Gallup’s ‘State of the Global Workplace Report’  reveals that only 11% of the UK’s workforce are engaged at work. A worrying 21% are actively disengaged. It is also forecast that eliminating active disengagement would add more than £50 billion to the U.K. economy . As one might expect, career opportunities, recognition, remuneration and management style all play their part in improving employee motivation but alignment with the brand is also a core driver of engagement. The idea that a ‘brand’ is just a marketing veneer that surrounds an organisation and communicates with its audience is no longer valid. Successful brands are powered from the inside and have a culture that guides everything that an organisation thinks, says and does. We need to recognise that all employees play a role in bringing the brand to life. When they do, the result is the creation of a ‘virtuous circle’. 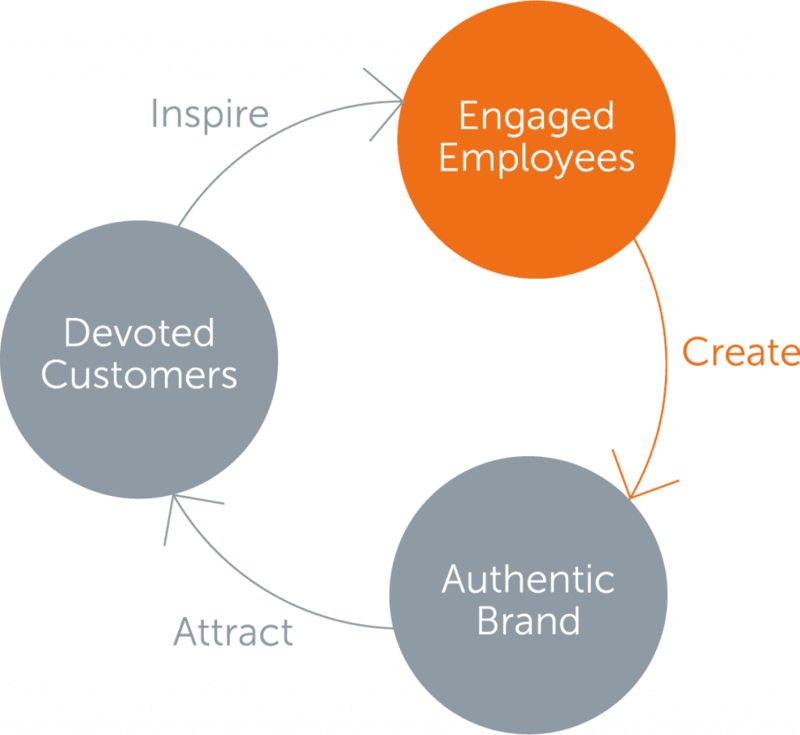 Engaged employees create an authentic brand (and a better customer experience), an authentic brand attracts devoted customers, and devoted customers inspire employees to build a better brand. As the report also indicates, when organisations successfully engage both customers and employees, they experience a 240% boost in performance-related business outcomes. So what are some of the key elements of engagement? Individuals want to be part of a shared vision. Millennials are increasingly asking, what is my company doing that is meaningful and what is my role in contributing to that? Meaning has become the catalyst for the creation of engaged employees. A shared purpose helps break down internal silos, increase collaboration and improve productivity. For brands to be believable they must be authentic. If employees don’t believe that the purpose or values are true and legitimate, there is no way they will be communicated to consumers. It goes without saying that management must be a paragon in this respect and lead by example. A brand compass document is a perfect way to simplify the key truths and align brand values with real-life actions. A brand induction process for new employees is essential. Each team member needs to understand their role in the delivery of the brand promise and customer experience. The brand alignment process should be ongoing, with strong internal communications. Employees need to be continually equipped with the skills, resources and authority to deliver on the brand promise. A recent Deloitte Survey  indicates that three-quarters of employees rate education and training as the top activity for creating a culture of purpose. Brand engagement is not just the domain of household names and blue-chip companies. Any business that wants to get the most from its human capital can benefit. Consider this – Innocent Drinks started out with a team of just 3 and grew in no small part from the enthusiasm of an inspired team with a clear purpose and vision. This created a culture that is self-evident in their approach to business and demonstrates how employees bring a brand to life. Gallup (2017) State of the Global Workplace Report. Deloitte (2013) Core Beliefs & Culture Survey.